The great dynamite factory at Ardeer in Scotland, the largest of its kind, is one of the most picturesque places in the world. Considering the unique and dramatic conditions that prevail amongst its workers, the neglect of Ardeer hitherto by novelists and dramatists is surprising. This may be due, however, to the fact that it is exceedingly difficult for a stranger to obtain access to the factory, while, once inside, the surroundings are rather trying to sensitive nerves. For six hours a day and two days in succession your life depends, at every moment, upon a thermometer. It is being draw off from large porcelain taps like ale, poured into boxes, and rattled along tramways. In the form of dynamite, it is being rubbed with great force through brass sieves, jammed into cartridges, and flung into boxes; and in the form of blasting gelatin, it is being torn by metal rods, forced through sausage machines, and cut, wrapped, and tossed into hoppers - all these processes proceeding as rapidly as if it were ordinary olive-oil instead of the deadliest explosion known to man. All around you are big cotton mills and storehouses as full of fleecy, white cotton as ordinary cotton mills and storehouses, but every pinch of the cotton, still white and fleecy, has been nitrated into gun-cotton, and would suffice, if explode, to cut you off in the beauty of your youth. Death instantaneous and pulverizing, encircles you, in fact, by the ton; but the man and the thermometer surround you also. The man’s eyes never leaves the instrument. Both are chosen for their perfect reliability; and endless precautions, innumerable rules, and the strictest discipline maintain Ardeer in a state of busy and peaceful security, and prevent it from being scattered periodically over the calm blue sea that widens endlessly on one side, or the hungry brown acres of Scotland which stretch away to the horizon on the other. Tunnels through the banks open everywhere. Tramways and lines of pipes on trestles cross each other diversely. This is the "Danger Area," the wide expanse in which the explosives are made and moved about. It is surrounded in an irregular semicircle by fourteen large groups of structures, from which rise fourteen large chimney-stacks. These include the nitric-acid works, acid recovery, ammonia-mill, potash-mill, "guhr"-mill, steam and power houses, box-factories, washing, carding, and bleaching departments for the cotton, pulping-mills, and other contributing industries, connected by the steam railway tracks which join the Glasgow line. There are 450 separate structures, now occupying 400 acres out of the 600 owned by the company, which were, when the site was chosen by Mr. Nobel in 1871, a barren waste of sand dunes, stretching for a mile and three-quarters along the sea. Into this kingdom of high explosives you enter by the courtesy of Mr. C. O. Lundholm, the works manager, under the guidance of the engineer of the works, Mr. E. W Findlay. The strain upon your nerves begins mildly. Your hair is quite ready to rise, so ready that you can feel it awake and stretch itself at every spot of grease which may be nitroglycerin - and every stray pinch of cotton - which may be gun-cotton. Mr. Findlay explains that the nitric acid thus made is mixed with a larger quantity of sulphuric acid, and removed in steel pony-cars to a station at the foot of each nitroglycerin hill. Thence the acids are drawn up by cable or blown up through pipes to a tank at the top of the hill by compressed air. You mentally compare the advantages of being blown up with compressed air to be blown up by other means, and smoothing down your hair, enter the Danger Area. He searches every man who enters, no matter how often the man may come and go, The girls, 200 of whom are employed, are not permitted to wear pins, hair-pins, shoe-buttons, or metal pegs in their shoes, or carry knitting, crochet, or other needles. These regulations are the outgrowth of experience and the long-ago discovery in dynamite cartridges of buttons and other foreign substances calculated to make trouble at unexpected moments. The girls are searched thrice a day by the three matrons who have them in charge. From the lack of hair-pins they wear their hair in braids, tied with ribbons, which gives them all an unduly youthful look. The searcher tells you that his chief trouble is with matches. Some of the lower-class male employees – there are 1,100 men in the factory – are willing at times to smuggle in matches for a quiet smoke in a secluded corner. This quiet smoke may of course produce a much louder smoke in a corner not so secluded, and is therefore rigidly banned. The discipline in the factory is most extraordinary, and to it must be attributed the marvelous immunity from accidents. At this point, too, you get your first glimpse of the "costumes." A man in a Tam O’Shanter cap comes up clothed from head to foot in vivid scarlet. He belongs to a nitroglycerin house. Then comes a man in dark blue, a "runner" or carrier of explosives. Then comes a man in light blue, who belongs to a smokeless-powder factory. All the girls are in dark blue. The different colours are used so that a superintendent at any distance can always tell if a man is on his own ground and attending to his own work. A few weeks since, a cartridge lassie in dark blue said to a man in scarlet, "Gi’e us a kiss," and he promptly gi’ed her one. This unlawful combination of colours caught the eye of an overseer hundreds of yards away, and the pair were instantly removed from the works and the pay-roll. Kissing and skylarking are absolutely prohibited during working hours, but on Saturday and Sundays the workers make full amends. If reports are to be believed, the workers are more than usually romantic in their tendencies, the alleged cause being the constant breathing of nitroglycerin; and inquiring Pickwicks have taken many notes there upon, in which the statistics of marriage and population are not entirely neglected. You have now reached the bottom of the hill (all nitroglycerin factories are called hills) and are in a wooden cabin, with a floor of loose sand, where the making of dynamite and blasting gelatin actually begins. Dynamite consists merely of liquid nitroglycerin which has been absorbed by some porous material. The liquid was discovered by Sobrero, an Italian, in 1846. Its transport and use were attended with such danger, however, that the late Alfred Nobel conceived, in 1867, the plan of absorbing it in some non-explosive medium. After experimenting with saw-dust, brick-dust, charcoal, paper, rags, and kieselguhr, he finally settled upon the last named as the best material. Kieselguhr, known in the factory as "guhr," is a silicious earth, mainly composed of the skeletons of mosses and microscopic diatoms, which is found as a slaty black peat in Scotland, Germany and Italy. Before being used it goes to the guhr-mill, where it is calcined in a large kiln, rolled, and sifted, the result being a very light pink powder of the consistency of flour. In the house you have entered, twenty-five pounds of kieselguhr, with one pound of carbonate of ammonia, are weighed into a wooden box about three feet square and eighteen inches deep. Upon it is drawn seventy-five pounds of nitroglycerin from the filter tank by a man in scarlet. Another man in scarlet, with his arms bare to the shoulders takes the box to a table, and gives it a preliminary mix, to see that all the nitroglycerin is roughly absorbed. Then a man in blue seizes it, places it with other boxes on his hand-car or bogie, and pushes the load off to the mixing houses. At half-past six on the morning of the 24th February, one week after the writer’s visit to this house, it was the scene of a very disastrous explosion. Twenty-four hundred pounds of nitroglycerin was collected here, in the tanks and boxes mentioned, and from some cause which may never be known it exploded, killing six people – a chemist, a foreman, and four workmen. A few other employees were slightly hurt by flying debris. The sound of course was tremendous, and the effects of the explosion, which were very clear in Irvine, three and one half miles away, are said to have been so strong in a town ten miles away that the gas lamps were extinguished by the air concussion. A disaster such as this, whose suddenness is not its least painful characteristic, cannot of course be minimized in its tragic importance. At the same time, it serves as the best possible testimony to the value of the system of protection employed, That over a ton of nitroglycerin can explode in the heart of a factory where 1,300 people are at work, and only six men, within a few feet of it, lose their lives, shows better than any other evidence the meaning and value of the Ardeer mounds. You follow the box to a mixing house, this, in the case of dynamite, is a large wooden cabin, containing a long narrow table on each side. In it six girls are at work. The runner sets the open box of the mixture down in the doorway. A girl hoists it to a table, and flies at it with bare arms as if it contained flour and water. She mixes it thoroughly. Then she takes a big wooden scoop, jabs it into the box, and dumps the scoopful into a raised box of the same size, with a brass sieve bottom. She then, as if the sieve bottom were a washing-board, rubs the dynamite with all her strength against the sieve, forcing it through the small holes. A few of the girls use a leather hand-flap to rub with, but most of them prefer their bare hands. You view the process with consternation. Hitherto you have looked upon dynamite as something to be regarded politely from a safe distance as if it were a rattle-snake. The girls handle it, however, as coolly as if it were the sand on the floor. Some of it is continually split, of course, and mixes with this sand, but the sand is all removed at short intervals and buried. One of the few fatal accidents in the history of Ardeer took place near this house. A cartridge hut wherein four girls were working exploded, killing the girls. Burning dust from this hut fell into open boxes of dynamite in three other huts. The dynamite began to blaze, and deadly smoke from it, which consists of hyponitric-acid fumes, immediately filled the huts. Two girls in each had the courage to jump over the blazing boxes, and escaped; but the others, six in number, were suffocated in a few minutes. Thus ten persons lost their lives. When the huts were entered, the six girls were found seated in perfectly natural attitudes, their faces showing no trace of agony or fear. It was evident that, having been stunned by the sudden explosion, they had suffocated before recovering from the shock. It will be noted that the loose dynamite burned and did not explode. This is one of several curious facts concerning dynamite which will be considered later. It may be well to state at this point that the two hundred and odd young ladies employed in this dangerous work are all strictly beautiful. Everybody who visits the factory admits this at once. Nobody, in fact, seems inclined to invidious comparisons among strong and courageous girls, when each of them has enough dynamite in her possession to blow a hole in Scotland. Moreover, there is some reason for the statement. The breathing of nitroglycerin by the workers gives them a universal clearness of skin, and among the fairer girls the contrast of scarlet and white in their faces is most unusual. You learn that (perhaps in consequence of their complexions) the girls marry quickly after entering the factory. After being rubbed through the sieves the dynamite becomes a finely divided greasy, coffee-colored earth. It is now the dynamite of commerce, and is ready to be made into cartridges. As you approach one of the cartridge houses, which are small white one-story buildings, you hear a tremendous thumping. You ask your guide in some perturbation if it is a good day to at cartridge houses, but he smiles and says that the noise is merely the cartridge machines. The hut is about ten feet square, with a single door. Four girls are at work. Against the right and left walls are four spring pump-handles about the weight of a girl’s head. Each pump handle when pulled down forces a brass rod through a small conical hopper of loose dynamite fixed to the wall, and jams a portion of the dynamite down a brass tube at the bottom of the box. The girl wraps a small square of branded parchment paper around the bottom of the tube, folding it at the lower end. Then holding the paper with one hand, and jumping up and down as she works the pumping-handle with the other, she pushes dynamite down the tube till the paper cylinder is filled to a depth of about three inches. She then removes it, folds down the top of it, drops it through a slide in the wall, whence it rolls down into her own special box a finished cartridge. She replenishes her stock of dynamite with a scoop through a sliding door in the wall, from a box of loose dynamite which the runner has placed in a closet chest immediately outside. The girls work with the greatest rapidity. The sliding brass rod is actually lubricated with nitroglycerin. To see this operation – the brass rods flying up and down, damp with nitroglycerin, and dynamite being forcibly jammed down a brass tube – entirely destroys your appetite for further knowledge. It is incredible, and you want to go away, outside the "Danger Area," and think it over. But your guide takes you instead to a blasting gelatine cartridge hut. Here blasting gelatin, a yellow, tough elastic paste, which consists of about seven per cent. Of nitro-cotton and ninety-three of nitroglycerin, is being forced through a sausage machine, chopped, by hand, into three-inch lengths with a wooden wedge upon a lead-covered table and wrapped into cartridges, at the greatest speed. Blasting gelatin is fifty per cent. More powerful than dynamite, and the effect on your mind is to make you exactly fifty per cent. More uncomfortable than before; to multiply by one and one-half your desire to get away before any contretemps occurs which you would be in no position to either explain or avoid. There are forty-five cartridge huts, all heated by steam to not less than fifty degrees Fahrenheit. Nitroglycerin congeals at forty-three Fahrenheit and freezes at forty, so the huts must be kept warm. If the dynamite were allowed to rest against a steam-pipe an explosion might follow, and the pipes are carefully boxed, and the thermometer is always watched by the eye of authority. In addition to dynamite and blasting gelatin cartridges, the company manufacture cartridges of gelatine dynamite and gelignite, combinations of nitroglycerin, nitro-cotton, nitrate of potash, and wood meal. The gelatin explosives are specially adapted for use under water, being entirely unaffected by dampness of any kind. The company also make Ardeer powder and carbonite – explosives for blasting purposes in fiery coal mines, with a lower percentage of nitroglycerin than dynamite. The output of explosives of all kinds is an average of about one hundred tons per week. Nitro-cotton, which by itself and in combination with nitroglycerin as cordite and Ballistite is rapidly displacing gunpowder in every direction, is made and used by the ton at Ardeer. It is made from cotton-waste, the waste left on the spindles in the cotton-mills. This comes to Ardeer in bales, like bales of finished cotton, and is first washed, to remove all grease and dirt, carded, and reduced to a homogeneous mass in a big mill devoted to these processes. Then it goes to a great barn-like building where it is turned into soluble nitro-cotton or insoluble gun-cotton, as may be desired, the process taking place in small iron pans or hundreds of earthenware jars. Half the floor is taken up by the jars, which sit side by side in a shallow tank of cement about a foot deep. The object of this tank is to keep the jars cool by surrounding them with water during the nitration. Along one side of the room are the acid taps and lead pans. Four pounds of cotton are placed in a pan, and one hundred and fifteen pounds of mixed sulphuric and nitric acid are added. In a few minutes the chemical combination takes place, the acid is poured off, and the nitro-cotton receives its first washing. From this point, until every particle of acid has been washed out of it, it is liable to burn spontaneously at any instant. As one of the workmen dumps the pan load into the centrifugal or acid separator, it may go up with a flash and a great column of yellow smoke; and this not unfrequently happens, but does no great harm except, perhaps, to beards and eyebrows. It takes fire slowly and gives full warning. It now goes to another department and is washed repeatedly, kept for a week in water tanks, pulped in ordinary pulping-mills, and dried in rotary centrifugal machines until all but thirty per cent. Of the water is eliminated. The remainder is dried out of it on the shelves of a great drying-house, where a temperature of from 100 to 120 degrees Fahrenheit is maintained by hot air through fans. At Ardeer this nitro-cotton is used in enormous quantities in combination with nitroglycerin to make blasting gelatin, of which it contributes seven per cent. ; and Ballistite, which consists of sixty per cent. Of soluble nitro-cotton and forty per cent. Nitroglycerin. The extraordinary affinity of soluble nitro-cotton for nitroglycerin is a curious chemical fact. No matter how much water is presented in the mixing-tank, every particle of gun cotton will find and absorb the nitroglycerin, and this wet mixing process as invented and carried on at Ardeer is admirable of its kind. The material for cordite, in the form of cordite paste, is made in large quantities at Ardeer, and sent to the government factory at Waltham, where the government smokeless ammunition is made. Ballistite is a speciality at Ardeer, and is rapidly displacing the other smokeless powders for sporting purposes. Its admirers claim that it is stronger than any other, cleaner in the gun, perfectly smokeless, and entirely unaffected by heat or dampness. It can be soaked in water and fired without loss of efficiency. Since the professional pigeon shots have largely adopted it, and the weekly scores in the sporting papers show the majority of kills to its credit, the shot-gun fraternity, so numerous in England, have taken to it en masse. Ballistite is made in three forms: in cubes for cannon, in minute rings for rifles, and in square flakes for shot-guns. As first made and dried, it is a light brown elastic paste. This is run through steel rollers which are heated to 120 degrees till it becomes as thin as tissue paper and transparent. It is like thin, elastic sheets of silky horn. Then it is cut up in cutting machines into grains of various sizes for rifles or shot-guns, as the case may be. These processes are most ingenious and mechanically interesting, and occupy several large mills by themselves. In all are the thermometers and the shoes. The machinery in nearly all cases represents original inventions, either conceived in Ardeer or invented by Mr. Nobel, who was the originator of smokeless powders. Absolute cleanliness reigns. Dust is never allowed to collect, and the small quantity of sweepings from the leaden floors are daily burned. The subsidiary departments are full of interest. "India" and "Siberia" are two magazines where the company’s explosives and others from all sources are tested through long periods under high heat and severe cold respectively. India of course the more dangerous, and before entering it your guide climbs a ladder on the embankment which surrounds it and peeps through a three-inch hole to read the thermometer projecting from the roof of the house inside. India caught fire in 1895, and would have harmed nothing but itself had not some over-eager firemen gone inside the banks and attempted to extinguish the fire. In the explosion which occurred two were killed and two other employees injured. To avoid a repetition of this occurrence a huge sprinkler now rises in the centre of the hut, by means of which at the first sign of fire the whole interior can be deluged from a safe distance. A thermo-electric tell-tale also runs from India to a laboratory. 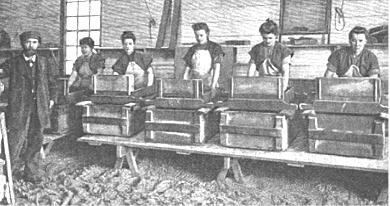 In the packing houses the cartridges are packed by girls into five-pound cardboard boxes, which in turn are grouped in fifty-pound wooden cases. These cases are taken in hand-cars to the magazines and thence to the beach, the railways running into the sea. The cases are transferred to boats and loaded into the company’s own steamers, which carry them to all the Channel and neighboring ports for shipment all over the world. There are also sample magazines, an Armoury containing all ancient and modern small arms; a shooting range, with its attendant officers and experts, where the explosives for rifles and shot-guns are carefully tested; laboratories, and contributing departments of all kinds. Having now inspected the factory in all its interesting entirety, you are confronted with a statement so extraordinary as to be almost incredible, viz., that despite the manufacture by the ton of all these deadly explosives; Ardeer is one of the safest factories that you could possibly be in. In the whole period of its existence, about twenty-five years, the entire loss of life by accidents, including the sad occurrence of February 24th, has been only twenty-one. This, compared with the number of people employed, is lower than the death-rate in any cotton-mill, woollen-mill, foundry, boiler-shop, shipyard, or other large manufactory. The main cases of this excellent showing is the admirable character of the discipline imposed and the firm and careful system of management. But the rigid, intelligent, and systematic way in which explosive factories are guarded by government regulations and government inspectors undoubtedly also plays a large part in this result. The nitroglycerin compounds, however, are far from being as dangerous as is generally supposed. Nitroglycerin itself is always a possible source of explosion, but up to this year no accident had ever attended its manufacture at Ardeer. The accidents that have occurred have been due to the handling of it after it has been made. With regard to dynamite, its actual safety as an explosive was ever the pride of its late inventor, Mr. Nobel. He claimed that dynamite could not be exploded by being thrown to the ground from any height; that it could sustain any degree of shock without explosion. 1. A cube of iron weighing 420 pounds was hoisted on crossed poles above an ordinary packing box containing fifty pounds of dynamite cartridges, the box resting on a board on the ground. The rope was cut by electrically exploding a cartridge against it, and the weight fell twenty-five feet, smashing the box completely and pulverizing some of the cartridges; but there was no explosion. 2. The same experiment was repeated with a box of blasting gelatin cartridges, the fall being twenty-five feet and the iron weight 470 pounds. Box and contents were crushed and scattered, but there was no explosion. 3. A one pound tin of gunpowder was placed on an open five pound box of dynamite cartridges and exploded. The dynamite caught fire and burned up, but did not explode. 4. The same experiment was performed with a five pound box of blasting gelatin cartridges with the same result. 5. A dynamite cartridge was set on fire by a fuse, and burned rather rapidly. It would have burned away completely, but a detonator had been placed in the middle, and when the flames reached this the other half of the cartridge exploded. 6. To show the strictly local force of dynamite, a one pound cartridge was hung eight inches above a three-eighths of an inch boiler-plate, which was lying on two bits of wood and exploded. The plate was only slightly bent. 7. A similar cartridge was laid flat upon the same plate and exploded, the result being a hole torn in the plate about the size of the cartridge. 8. A similar cartridge was then placed on a similar plate and covered with sand. Upon exploding, it tore a large hole in the plate. Dynamite and blasting gelatin when set on fire will merely burn away without danger. If compressed, both will burn until the heat reaches a point high enough to explode the remainder, but this always requires sufficient time to give bystanders full warning and enable them to reach a point of safety. All the nitroglycerin compounds are exploded by detonation; that is, by means of explosive caps like percussion caps which fit on the ends of the fuses. The cap explosion is a mixture of mercury and chlorate of potash, and the Nobel company have a large and separate factory in Scotland which is devoted to the manufacture of fulminate of mercury and various kinds of detonators. The explosive force of No. 1 dynamite, weight for weight, is four times that of gunpowder. Bulk for bulk, the dynamite being much heavier, it is over seven times as powerful as gunpowder. Blasting gelatin has nearly six times, weight for weight, and a fraction less than ten times, bulk, the power of gunpowder. Gun-cotton and No.1 dynamite are about equal in explosive strength. Dynamite is not allowed on passenger trains in England, but is transported with great freedom on the continent, and thirty thousand tons of it have been shipped on the English and Continental railways without accident to date. Of course, every package and case carry explicit instructions, but that the danger is small the immunity from explosions in transport clearly shows. The moral of which is, that dynamite is safe and blasting gelatin is safer if they are treated with only reasonable care. The accidents do not occur here but in the use of it, says Mr. Johnston. If the company’s explicit printed instructions were followed, accidents would scarcely be known. Accidents often occur in thawing after an explosive has been frozen; but these arise from the incredible recklessness of miners. Small accidents, also, transpire at Ardeer in the repair of pipes. A drop of nitroglycerin which has secreted itself in a crack or crevice in the metal is sometimes struck by a hard tool, and costs a plumber one or more fingers. These facts concerning dynamite are well known, and they are very reassuring. As you enter the train to leave Ardeer, however, the old habit of doubt reasserts itself. A bit of white fluff on our coat sleeve is viewed with the greatest suspicion. The question arises, Is it cotton or gun-cotton? Nerving yourself to the ordeal, you deliberately pick it off. You then carefully throw it out of the window to wreak its fell purpose. If it has one, on the landscape. Then you settle back with a vague desire to look at a thermometer. You have acquired a respect, an admiration, for any and all thermometers, which will abide with you to the end of your days.